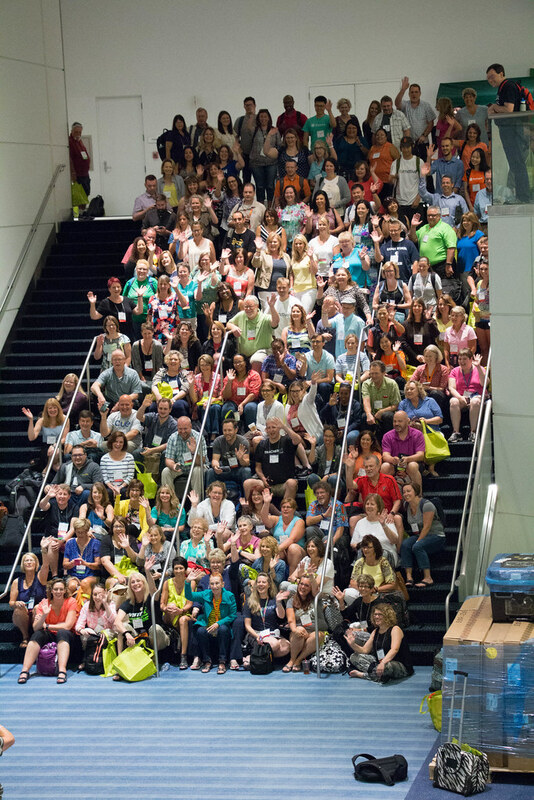 Just one last ISTE conference-related post for this season. Promise. So, coding was also a big topic again this year. After proclamations from the president and corporporate leaders that all students should take computer programming classes, and lots of edtech vendors jumping on the bandwagon, how could it not be? But the most rational statement on the matter came from Hadi Partovi, co-founder of Hour of Code, the program responsible for jump starting the everybody-must-code movement. At the pre-show for the Tuesday morning keynote he disagreed with that idea, telling the audience flat out that no, every students does not need to learn to code. But every school should offer computer science. Partovi didn’t have much time to elaborate (in typical talk show format, the next guest was waiting in the wings) and his point was quickly overshadowed a minute or so later by the R2D2 robot he rolled on stage, accompanied by an announcement it would be available for selfies. Shiny objects. However, that difference between requirement and opportunity needs more emphasis. Kids certainly need to understand the concepts of programming, the logic behind the computing devices, visible and not, they use everyday. That needs to be a fundamental part of the basic course of study, replacing the rote processing and endless repetition in the K12 curriculum we call “math”. The computer science classes need to be available for those kids who want to go further. Not to prepare them for one of the umpteen thousands of jobs the industry claims will go unfilled, but because the student chooses to explore an area of study that interests them. Once again, coding should be one part of every child’s total school experience. An experience that offers them the broadest possible spectrum of what’s available in the world, and helps them make informed choices. Ok, the one question most people ask me every year when I get back from ISTE is: what was hot? What new technology was everyone talking about? Where did the crowds gather? And the answer for 2016, of course, was VR; virtual reality. During the conference, I heard more than a few people declared that virtual reality was going to revolutionize education (including the Sunday keynote speaker). 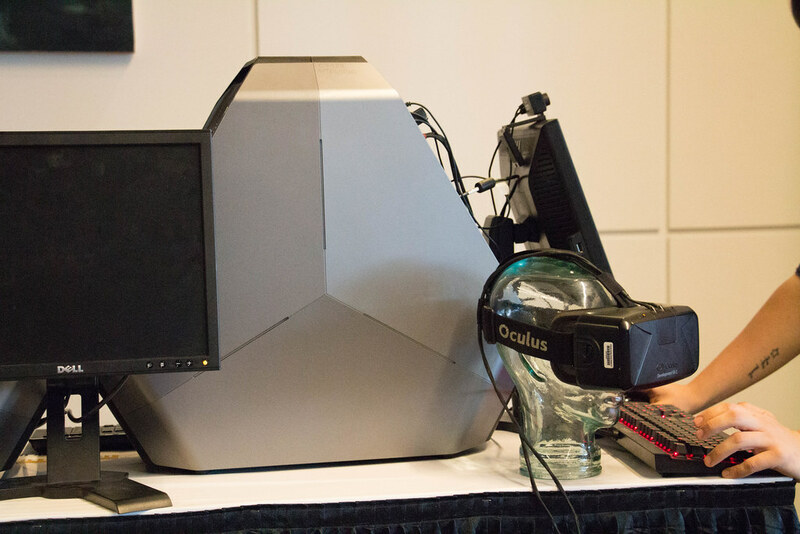 Many vendors were offering VR “solutions”, even if it was just their old products with a VR component grafted onto the side. And around the convention hall there were multiple scenes like this one (at the Google booth) with people staring into cardboard boxes and plastic Viewmasters, tilting their heads to get a better view. Of something. Of course the current reality in VR is that the technology is not even close to the threshold of revolutionary when it comes to education. A big non-portable machine, fast CPU, powerful graphics processor (re: expensive), with a headset and software costing about half that of the computer to run it. 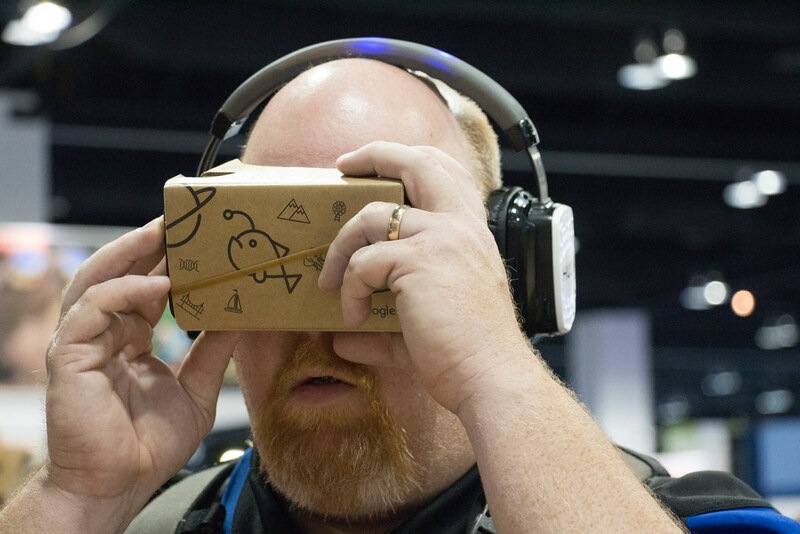 However, I’m not disparaging the push for virtual reality on display at ISTE. It’s only the beginning for this medium, and I’m actually very optimistic that VR will become an important tool for student learning in the very near future. However, just not as the new, “exciting” (re: very profitable) content delivery system that Pearson and other companies at ISTE are hoping for. In just the past few years, the tools for creating virtual reality experiences have become both easier to use and much less expensive. I believe that VR, both still images and 360 video, could become a wonderful creative tool for students (and teachers) to tell stories and present ideas. It happened over the past ten years or so for 2D video, as the availability of good cameras packaged in relatively inexpensive mobile devices and powerful editing programs made the technology accessible to many kids. Not to mention the rise of YouTube and other online channels for easy, ubiquitous distribution. Something similar is going to happen for VR. I’m already doing sessions that show teachers and others an easy process to take and publish basic immersive images with their smartphones (and why they’d want to). And the tools are getting better all the time. Good quality dedicated VR cameras are already well under $1000. Which sounds expensive but not considering the cost of getting lower quality images just a few years ago. Or what we had to go through in the late 90’s when I first started playing with this technology (anyone remember QuickTime VR?). Now I’m not going to tell you that every student should study virtual reality (like STEM, coding, and whatever comes next). Students deserve some choice in what they study. VR is a creative tool with great potential, one of many, digital and not, students should have the option to explore and use while they are in our K12 classrooms. But I’m betting there are kids somewhere already working on a presentation that includes immersive images they created. And I’m excited to see the first fictional story told using VR video. I know it’s coming very soon. A few shots from our time in Denver for the 2016 ISTE conference. Not many of the photos I took are from the actual event but that’s fine. Plenty of other people took those shots. As always, more of my stuff is on Flickr. 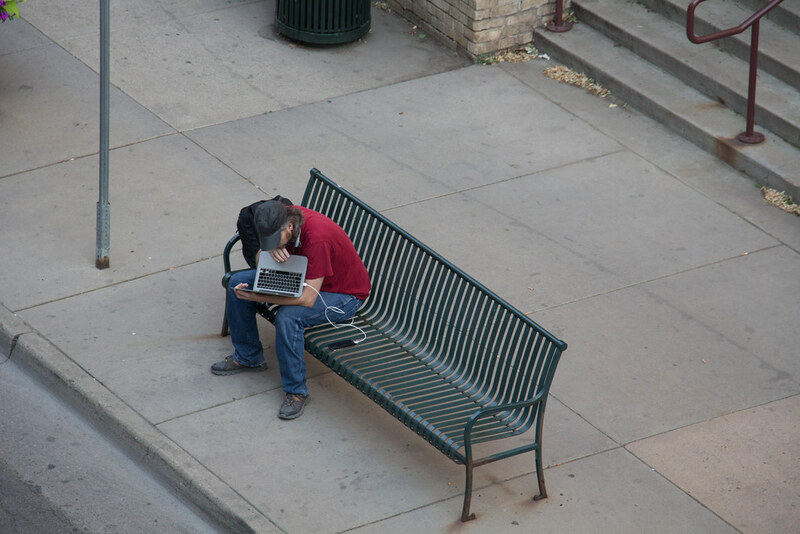 This young man looks like he might be part of the conference but was just computing while waiting for the bus. A group photo of the wonderful people who participated in the 10th annual HackEd unconference (which started life as EduBloggerCon) the Saturday before ISTE actually starts. 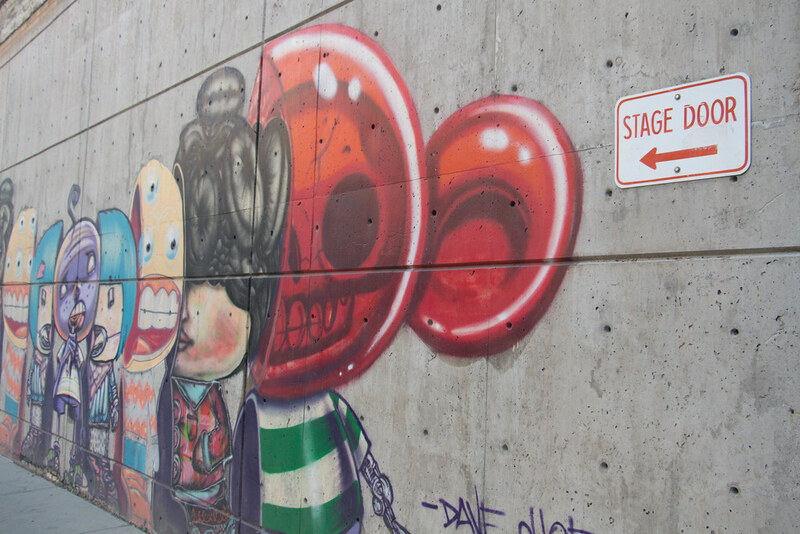 Next to the convention center and across from our hotel is the Denver Performing Arts Center. And every theater needs a stage door, with some interesting art work. I’m pretty sure I wasn’t the only photographer at the conference who took this shot. 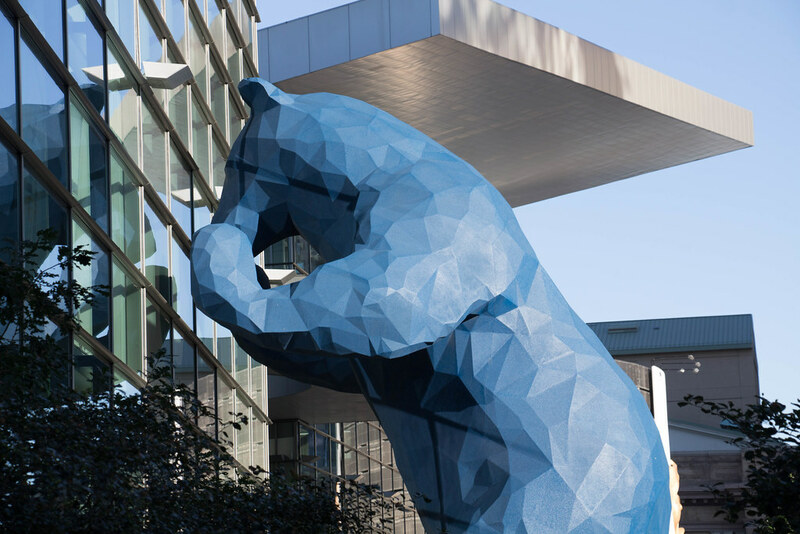 It was hard to miss the big blue bear curiously looking through the front window of the Denver convention center. When I go to ISTE, I’m mostly looking for interesting and new-to-me ideas for using technology to enhance learning. For adults as well as kids. While you can do much of that inquiry online, there is something about being immersed live in the community that cannot be duplicated digitally. At the same time I also make it a point to attend sessions by a small group of the same presenters, even if I pretty much know what they’re going to say. Because I also know they are people who will inspire me and jumpstart my thinking in unique ways. One of those people is Will Richardson. During his ISTE talk, Will compared the very trendy concept of makers spaces with computer labs, saying that schools need a maker culture, not spaces. It was almost a throwaway line, a relatively small point in his talk but also one that got stuck in my warped little mind. Wiil’s view of maker spaces as the new computer lab1An anachronism that should disappear but only seems to be reconfigured every few years with new devices. perfectly encapsulates the uneasy, slightly negative feelings I’ve had towards the maker space concept, as the chatter and activity around it has has grown over the past four or five years. It’s not that I disapprove of the idea of kids as makers. I love it. That’s exactly what school should be. But that’s not how the concept is applied in most schools. As happened with computing devices, someone’s idea of a “maker space” is set up in a corner of the library, stored in a vacant room, or assembled in a cart rolled between classrooms. With students performing pre-planned activities for a fixed period of time, before returning to their “real” work. In most schools I’ve observed, maker space is a pull out program for students that we know will pass the spring tests. A reward for completing that real work. An option for kids before or after school, or during lunch. An elective for students with space in their schedule. I’ve seen all of this in schools and more. A school with a maker culture, however, is one in which students are encouraged to explore all aspects of “maker” that interest them. Music, writing, science, video, coding, drawing, cooking, and many, many more topics that may not even occur to adults who think of “school” in very traditional ways. Auto shop, wood shop, metal shop were maker spaces when I was a kid, all of which have largely been removed from schools in this area. Once upon a time, all of this was part of a liberal education. Providing kids the opportunity to explore a wide variety of subjects during their K12 years. Making them aware of their options. Preparing them for life, not just for college. I know, it’s an ideal view of school. One that in the real world America of my youth was never perfectly implemented. That’s exactly what a school built around a maker culture would be. Rather than being a reconfigured computer lab. While I was away at ISTE, Evernote, the online note taking service, announced the unthinkable: they reduced the functionality of their free service. Among other alterations to the free tier, users may now access their notes on only two devices, instead of on as many as they could carry previously.2Evernote clarified the announcement later by saying a desktop browser did not count as a “device”. I learned about the changes to Evernote by overhearing a conversation in the Blogger’s Cafe at the conference. Several members of the group sitting behind me were not at all happy, complaining that Evernote was only trying to force them into one of the paid tiers. They vowed to move to something better (which probably meant something also free). Ok, this kind of change is not fun. But it’s also a good example of what I’ve said before: you can’t depend on free. It’s very possible the people on which I was eavesdropping will move to another notetaking application and be disappointed by it at some time in the future. The developers will also change the functionality. Or begin charging for some features, maybe the whole thing. Or the product will disappear entirely when they fail to make money on the venture. I suppose I’m the one who really has the right to gripe about Evernote’s announcement since they also raised prices for those of us who actually pay for the service. But I’m not going to complain. And I certainly won’t be looking at alternatives. This is a tool I use every day and depend on to keep my information life straight. Why wouldn’t I pay a reasonable amount for that? 2If you’re interested in more details about why I happily pay for Evernote, read this. In the end, a large part of the blame for the grumbling I heard in the Cafe lies with many of the vendors exhibiting at ISTE themselves. Over many years they have addicted educators to free or absurdly cheap, as in the case of most mobile apps, software, without making it plain that free is not a sustainable business model. On this matter of educators paying for good software, I agree with Gary Stager: pay now or pay later.3A post ironically published one day before the Evernote announcement. Software does not grow on trees. It is created by artists, programmers, writers, designers, and engineers who need and deserve to feed their families, just like the humble teacher. The continuous devaluing of software, along with other media, profits no one in the short-term and giant corporations in the long-run. This phenomena not only harms the earning potential of creators, but ensures that educators will be deprived of high quality tools and materials. Sorry, but you get what you pay for. I know what you’re thinking. We’re just poor teachers. Our budgets are slashed to the bone. We fundraise for crayons. Software is ephemeral. We should not have to pay for it like when we happily purchase “real” things; flash cards, interactive white boards, or that hall pass timer that reminds kids to poop faster. I must have missed that poop faster app. 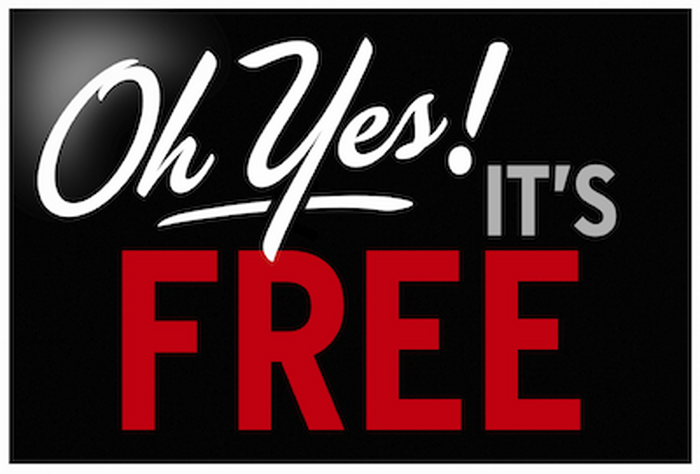 Is it free?